Keeping Up With the Kapenga's: Already 4! 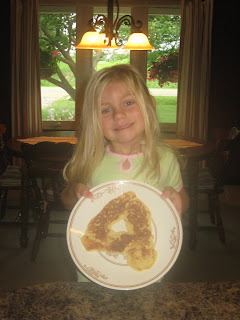 Yesterday we celebrated Jenna's birthday with her #4 pancake which she thoroughly enjoyed. Then after spending the morning playing we headed to Grand Rapids so she could have birthday lunch with her dad at none other than McDonalds. We stopped at the grocery store on the way home to pick up the food she had chosen for her "birthday meal" (as she called it)...Chicken Cordon Blue, corn on the cob and potatoes! I thought it was a delicious meal but I still laugh that it's a 4 year olds favorite! She was excited that since we live at grandma's house right now she got to enjoy birthday dinner with Gram and Uncle Travis as well. Allee and Aunt Nae stopped by in the afternoon with some cupcakes....yummmmmmmy!!!!! 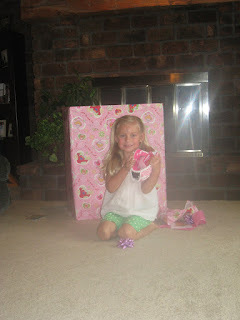 After all the eating it was time for presents, she was so excited and was trying to guess all day what they could be. First was the ball glove and ball, pink of course. She was thrilled since she loves to play catch and I've been asked several times why she has a ball glove at daddy's but not at mommy's. 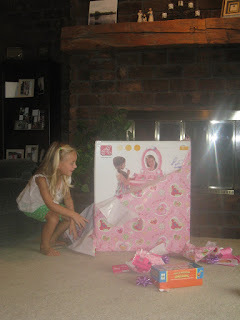 After some other little gifts her eyes grew wide as she stared at the big box still waiting to be opened. We found her a Step 2 brand Vanity with a mirror and little stool. She LOVED it! 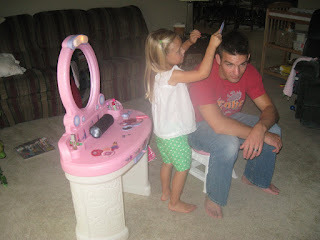 After finding all her lip glosses and nail polish Dave was her first client, he just got a haircut though :-). I think this will provide hours of fun as it was the first thing she went to play with this morning. Dave & I with the birthday girl! 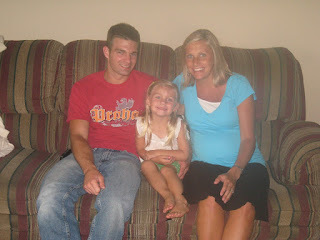 Not much longer and we'll be a family of 4. When putting her to bed last night I asked her if she had a good birthday, her response was "it sure was a busy day mom but it was a great day". Uhh! I thought about her yesterday and was going to call you, then forgot. Happy Birthday Jenna! We love you!